In 1954 JRR Tolkien defined modern fantasy. Elves, dwarves, dragons, orcs, wizards, all came to life in his four books and with their release, the face of science ficton/fantasy was forever changed. Tolkien took fantasy out of the world of fairy tales and into a world of high adventure. Fantasy is a genre that has often failed in Hollywood, but Lord of the Rings builds a serious and detailed fantasy movie. It is a wonderful film. Fantasy is a great paradox in Hollywood. The suits normally screw fantasy movies up so badly that no audience likes them. Since no audience likes them, they label the genre as a non-starter. Sometimes they try to line the insides of their Mercedez SUV's with baby sealskin with movies like Black Knight. With LotR, the money was spent and the actors were picked to fit the roles and scenes perfectly. Hollywood certainly drove this movie into our lives and with a $109 million budget I am sure they wanted to dive in but they left a lot of it alone rather than trying to commercialize the movie itself. Given its huge commerical success - it paid for itself in the first two weekends - we can be glad that all three movies were already filmed before the suits step in to muck things up. The Fellowship of the Ring has so much in it that three hours doesn't seem like enough time. Much of the background of the history is told in single lines. Often your eyes are too busy sucking up the scenery to comprehend what was said. 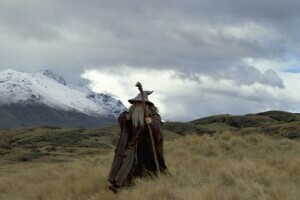 Gandalf's discussions with Saruman about the crystal ball's powers and later his conversation with Elrond about the orc-goblin hybrids is an example. Later, Gandalf speaks to a butterfly that returns later with the aid of a great eagle. Astute readers of The Hobbit recognize the eagle, but many casual viewers think the eagle and the butterfly are one. Once again, little is explained and our minds must be used to fill in the details. This gives Fellowship a quality of richness that will give us a fresh view each time we watch it. The DVD of Fellowship is a bit of an anomaly. We know they are coming out with a newer version in 60 days. We know that it will have almost an hour of new footage and include more features than we could watch in a lifetime. This initial release is a placeholder for the greater collectors edition. Still, on it's own it isn't bad at all. For $16 you get a 16x9 enhanced 2.35 to 1 picture and a Dolby Digital EX soundtrack. There is a second disc including a couple of interesting featurettes and a 10 minute preview of The Two Towers. There is no DTS track and no directors commentary, something that is missing from a movie as wonderful as this. For the money, one can hardly pass up this DVD even if it is temporary. Rare are movies that are big Hollywood hits and also truly great movies in their own right. Fellowship is one such movie and looking back twenty years we will see the great story, great characters and wonderful fantasy the movie paints for us. It is an excellent film.